Basically, I've been playing at Bodog Poker a lot lately. Why? Because I'm winning a hell of a lot more money than I have been at any other US poker room. It's the softest US friendly poker room out there right now, and it's not even close. Why do I win so much more at Bodog? This is a cool graph that shows the percentage of winning poker players seated at each online poker room throughout the day. I can tell you that the players are even worse than the graph indicates as well. It's not just that Bodog has very few winning players -- it's that the losing players are not just bad, they're exceptionally bad. You're not winning small pots off these players when they limp in and fold, you're winning huge pots when they call all-in with second pair or worse -- they just love to gamble. I've played at all the rooms on that list, and Bodog is on par with Party Poker. If you're a US player you'll have to take my word for it, but trust me when I say the players I've seen at Bodog are just as bad (if not worse). The source: Bodog Casino and Bodog Sports. The vast majority of players at Bodog are either casino gamblers or sports bettors. Only a tiny fraction of people searching for the Bodog website are looking for the poker room specifically. Everyone else is looking to gamble in the casino or sportsbook. I'm sure you're thinking "that's all well and good, but so what?" Well, this means that the Bodog poker room is rammed full of casino gamblers and sports bettors that are looking to play poker for fun.They know the basics of Texas Hold'em (the most popular game on offer), but they have zero skill. They head to the poker room expecting to lose, and they keep on playing until they do. So instead of sitting down at a table full of experienced poker players, you are sitting down with a bunch of gamblers ready to hand their money over. It's unlike any other online poker room accepting US players right now. 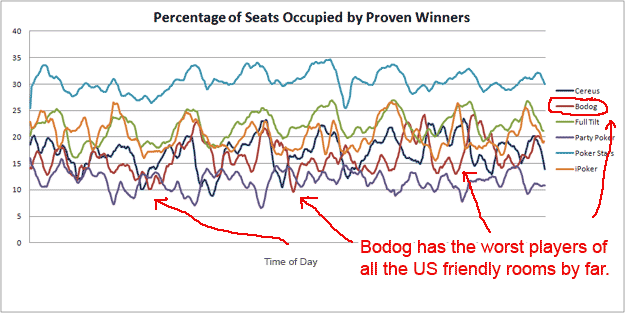 However, I'm not going to lie and tell you that Bodog is for everyone, because it's not. Due to the fact that the room gets most of its traffic from gamblers jumping over from the casino, the player pool isn't huge. Therefore, there is limited action at the $400NL stakes and above. $200NL is okay most of the time, but you'd struggle to get much action above that. So if you're a high stakes player, Bodog isn't a great option. However, if you're playing at $200NL or lower ($100NL or lower ideally), Bodog is a goldmine. Honestly, if I wasn't also playing at Party Poker right now (it's just like Bodog, but doesn't accept US players), I'd shift my entire bankroll over to Bodog. Quick tip: Once you get going, make sure you're taking advantage of the note taking feature. It's the perfect tool for tagging the biggest fish and milking them from one session to the next. The games at Bodog Poker aren't going to be soft forever. At this time of writing though (April 2019), let's just say I've been adding more money than ever to my weekend beer fund thanks to the bad players at Bodog. 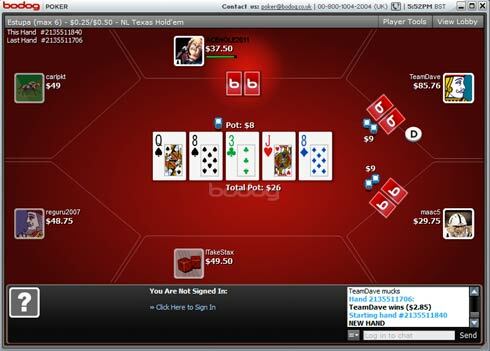 It doesn't bother me if you move to Bodog Poker or not -- in fact I'd prefer it if you didn't. It's just that every day you spend playing at a different online poker room, is another day you've lost your chance to take advantage of some fish deciding to call all-in with K8o when you've got KK. Bodog are currently offering a 100% up to $1,000 bonus too (for all new players). Add that to the soft competition and you have the opportunity to win a ridiculous amount of money if you know how to play good poker. I'm going to get a few 100 hands in for myself at Bodog now.